Get all the flavor you love about s'mores without sitting in front of a campfire with these S'mores Cupcakes. 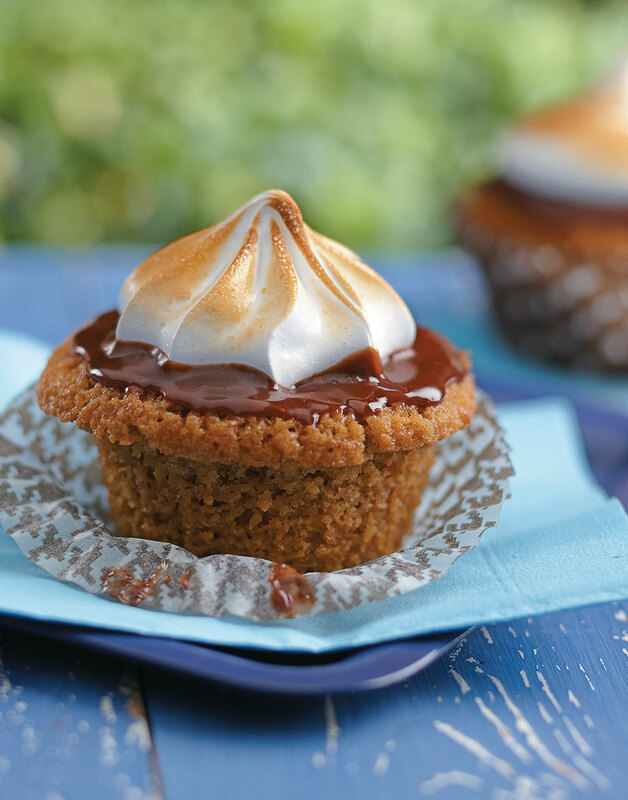 Buttery graham cracker cupcakes are topped with a rich ganache, then piped with marshmallow. Paper cupcake liners work best for these cupcakes. Foil liners trap moisture, resulting in gummy, soggy cupcakes. And if you'd rather not make your own marshmallow topping, substitute with 2 cups marshmallow creme. Preheat oven to 350°. Line a 12-cup muffin pan with liners. For the cupcakes, whisk together graham crumbs, flour, cinnamon, baking powder, salt, and baking soda in a bowl. Cream butter and sugar in a bowl with a mixer on medium speed until fluffy, about 3 minutes. Add eggs, one at a time, mixing after each addition until incorporated. Alternately add graham mixture and buttermilk (starting and ending with the graham mixture) until combined. Fill each muffin cup two-thirds full with batter. Bake cupcakes until a toothpick inserted in centers comes out clean, 25–30 minutes; cool in pan 5 minutes. Transfer cupcakes to a rack to cool. To assemble, spread 2 tsp. Chocolate Ganache over top of each cupcake, then pipe on Marshmallow Topping. Grind the crumbs until fine. Rather than being a sandy consistency, they should be almost a powder. A stand mixer does the best job of creaming the butter and sugar until fluffy, but a hand mixer works too. For the most tender cupcakes, avoid overmixing by alternately adding the graham mixture and buttermilk.